JUPITER, Fla. — Spring Training games have been going on for about a week. With so many players filtering in and out of the lineup each day, it’s difficult to keep track of what really matters. * Scouts are raving about right-hander Jarred Cosart, who is making a push to be the No. 2 starter. “Top of the rotation stuff,” scouts say. * Miami hasn’t announced it’s Opening Day starter, but the safe assumption it will be Henderson Alvarez. The rest of the rotation is shaping up as Cosart, Mat Latos, Dan Haren and the fifth starter — Tom Koehler, Brad Hand or David Phelps. Giancarlo Stanton, right fielder for the Miami Marlins, was on pace for the National League Most Valuable Player award in 2014. Then he suffered a facial injury as a result of being hit by a baseball and the team fell out of wild card contention, opening the door for Clayton Kershaw, starting pitcher for the Los Angeles Dodgers to win the award. The coming season presents another, and even more likely, chance for Stanton to finish what he started. Stanton has fully recovered from his injury and should have full confidence at the plate despite his injury. He is wearing a new custom-fit batting helmet that protects his face. His confidence in the team around him should also be boosted after signing the largest contract in professional sports history and Miami made several off-season moves to improve the roster. 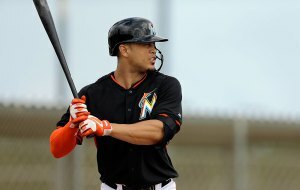 JUPITER (CBSMiami/AP) — It’s been a successful start to the spring for Miami Marlins slugger Giancarlo Stanton. Despite not getting a hit, Stanton was pleased with his first at-bats of the spring. Stanton went 0 for 2 in his first game since being hit in the face by Mike Fiers’ fastball in September. Stanton had a fly out to left in the first inning against Carlos Martinez. Three innings later, he flew out to right. Stanton said that too much was being made of his comeback from the injury. He was wondering when everyone will stop asking him about how he feels. “I guess I’ve got to get a hit first,” Stanton said. In 30 Teams, 30 Posts, I write a post about every MLB team in some way in the lead-up to the beginning of the 2015 season. Previous installments can be found here. Today, we honor the Marlins the best way possible: Giancarlo Stanton dingers. There are many ways to look at the Miami Marlins. You could look at a team on the rise, of Ichiro’s final days, or Jose Fernandez’s return from injury. Or, you could just look at lots of Giancarlo Stanton home runs. JUPITER – Giancarlo Stanton will wait until Thursday for his first at-bat against opposition pitching since being struck in the face by a fastball Sept. 11. 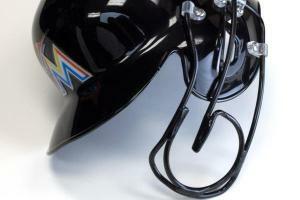 The Marlins play St. Louis on Thursday at Roger Dean Stadium in their first spring exhibition against a major-league team. Today at 1:05, Miami plays Miami, as in the Hurricanes, but Stanton will play in a simulated game on the back fields rather than batting against college pitchers. Last week I looked at the Atlanta Braves and tracked their progression as a franchise within the last 5 years. This week, I will continue my analysis of the National League East by looking at the team that finished 8 games under .500 and 4th in the division last year, but seems to be on the rise: the Miami Marlins.